Since becoming personally involved in elections, I’ve found myself watching televised election coverage on Election Night. 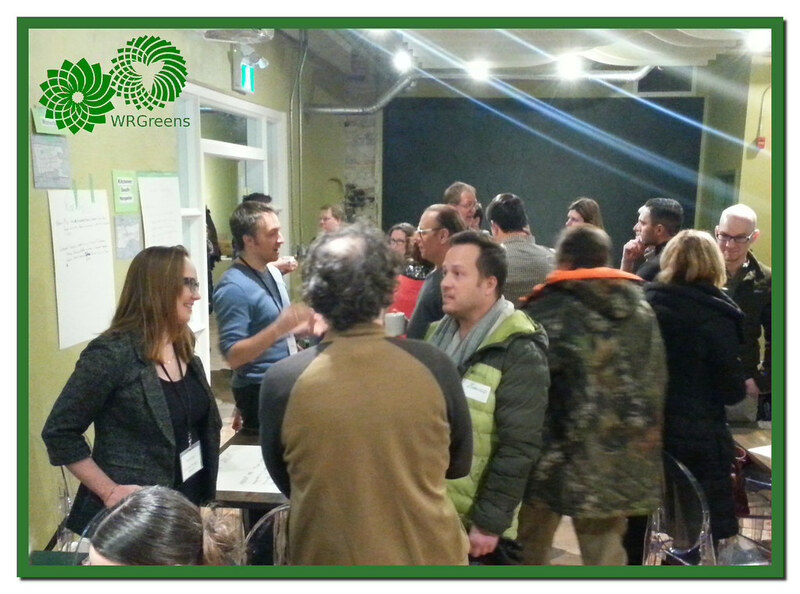 This year, that was at Ethel’s Lounge in Waterloo with three of our 5 Waterloo Region Greens Candidates and WRGreens volunteers and supporters. Each broadcaster concentrates on the ridings their partisan experts consider important, instead of showing the riding results equally, so it’s hit or miss for all the rest. We chose to watch TVO’s coverage that night at Ethel’s, as TVO was the only MSM broadcaster to include a Green leaning commentator. At the end of the day, it’s hard to get the big picture. So for my own interest, I decided to check out Elections Ontario (unofficial results) to get an idea how our Green Candidates did overall. Although I did this for my own interest, Bob pointed out this might be of interest to others, so here it is. 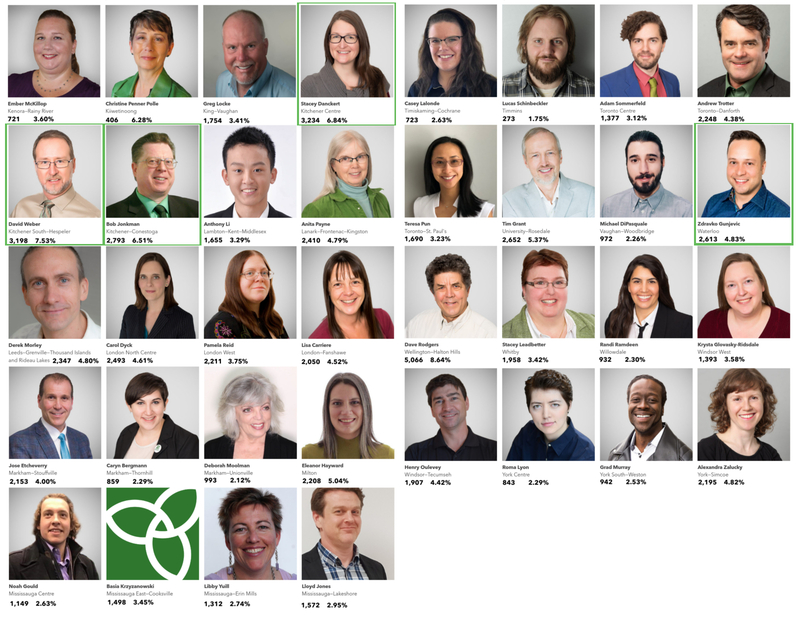 All five of our Waterloo Region Greens candidates did very well overall. Kitchener South—Hespeler candidate David Weber‘s 7.53 riding vote percentage was the 6th highest in Ontario (up from 7th in 2014). 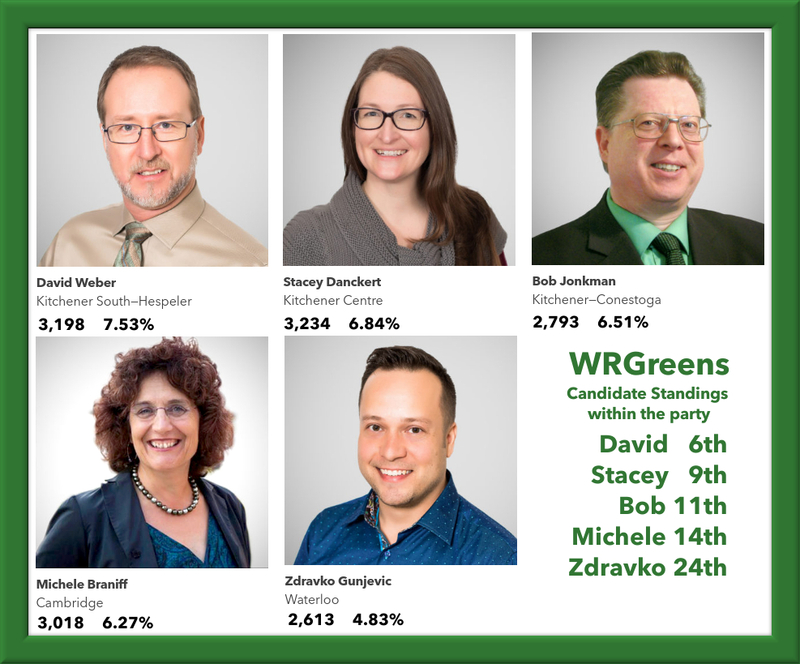 Kitchener Centre‘s candidate Stacey Danckert ranked 9th with 6.84%, Kitchener—Conestoga candidate Bob Jonkman ranked 11th with 6.51%, Cambridge candidate Michele Braniff ranked 14th with 6.27%, and first time candidate Zdravko Gunjevic ranked 24th with 4.83% in Waterloo. the low probability of winning, even when you are the best candidate in your riding. 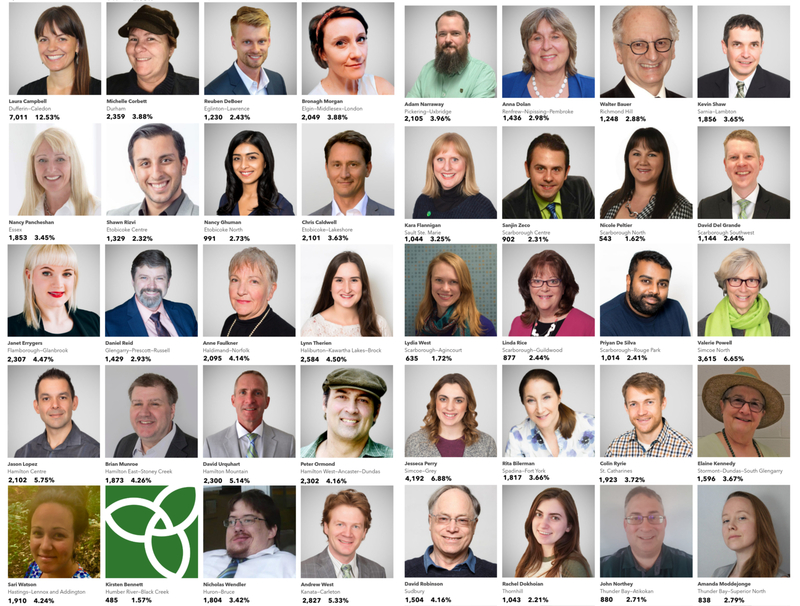 Green Candidates are well aware of how little chance they have of being elected, but in spite of everything, excellent Green Party Candidates keep stepping up. Working together is the WRGreens superpower. 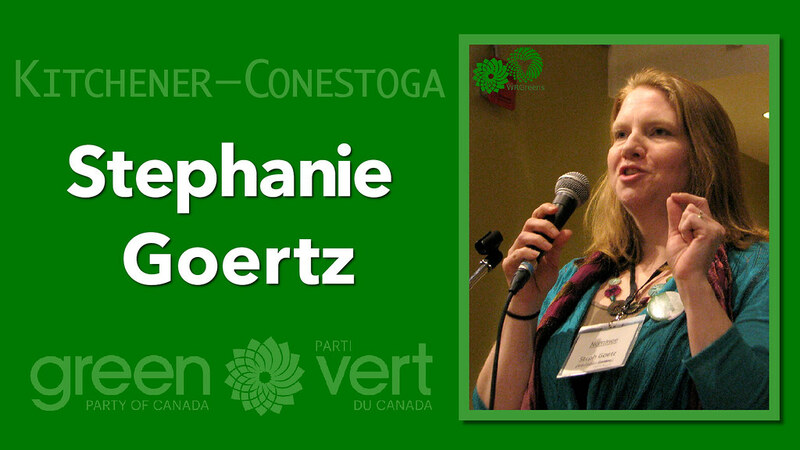 Stacey Danckert brought us all together under the unofficial WRGreens umbrella during the 2015 federal election, and our regional cooperation is paying off. Cooperating, sharing our experience and resources has been incredibly helpful for us here in Waterloo Region. And not just during elections. We’ve been actively working to raise the Green profile between elections, by hosting information tables at local summer festivals where we can, hosting our own events and participating in others as appropriate, and building our online presence on the WRGreens blog. We’re always learning, and we’ll do it even better next time. Especially now that Mike Schreiner has won that so important first seat. Strategic Voting is a only a good strategy for the candidate who gets the vote we would rather cast elsewhere. I know how hard it can be to stay positive, and to keep focus on the campaign. But after media suppression, I think our worst threat is falling prey to propaganda. The strategic voting narrative continues to be powerful, and it is always the worst when it strikes from within. In many ways I think this is especially difficult for Greens, because Greens are the unparty party, the party that applauds other parties when they appropriate our ideas, even when implemented badly, because it’s a start. The stakes are so high that sometimes a candidate falls victim to strategic voting propaganda, and suggests their supporters vote instead for a competitor who might win against a greater evil. This really isn’t surprising in a party that understands the importance of working together for the common good. 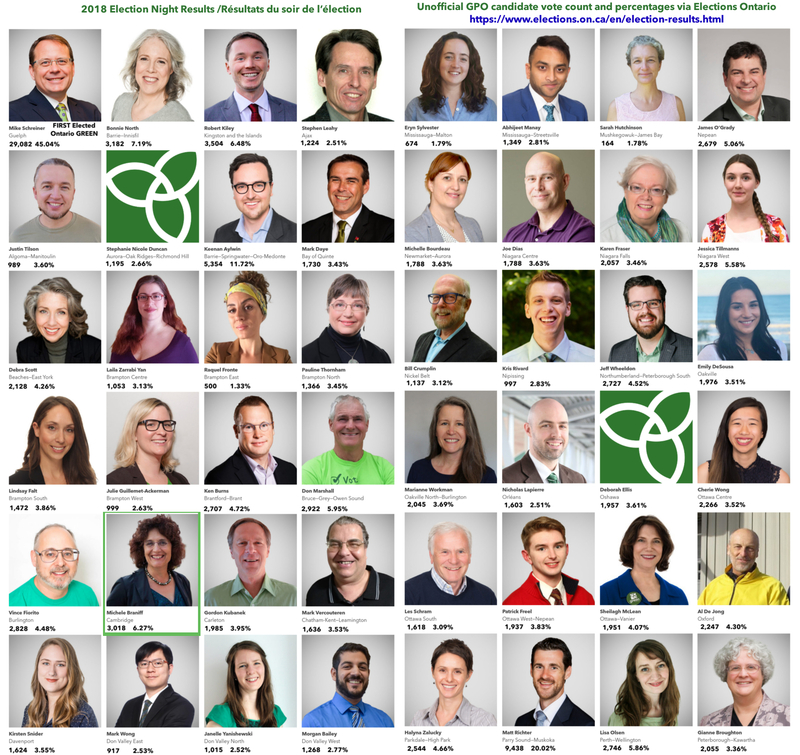 Green Candidates aren’t professional politicians, they’re people from all walks of life who get involved because they understand our future is at stake and change is no longer optional. They’re in this because serious issues that need to be addressed, not for the greater glory of the party. One of the reasons strategic voting is wrong is that it is always built on the faulty premise that old statistics— whether gleaned from past elections or recent opinion polls— can accurately predict who might win. If this were true, there would be no need for the trouble and expense of elections. In this campaign, I was particularly unhappy to see a terrible strategic voting meme initiated by Meanwhile In Canada. The post in question actually told voters to vote NDP except in 5 cases, where it said voters should vote Green because Green candidates could win in those 5 ridings. Some Green folk helped spread this meme thinking it might help change the perception that Green candidates couldn’t win. I don’t know what exactly that prediction was based on, but two of the candidates who went on to rank in the top 5 percentages in their ridings were excluded from the 5 supposedly winnable ridings. We will never know how many more votes those candidates (or all the Green candidates MiC strategically dismissed) might have won if that social media maven hadn’t been telling voters to vote against Greens in the last week of the campaign. Although there are no scientific studies of which I am aware, I think Strategic Voting is the most powerful vote suppression tool going. When people are convinced their vote won’t have any effect, or worse, that it will help elect the boogeyman provided by our FPTP system, many feel the only responsible choice is not voting. We only get one vote. That’s not a vote for a party. It’s not a vote for a party leader. It’s a vote for our local representative. I have to wonder how much better Greens would do in elections if they didn’t have to spend half the election explaining what’s wrong with Strategic Voting. 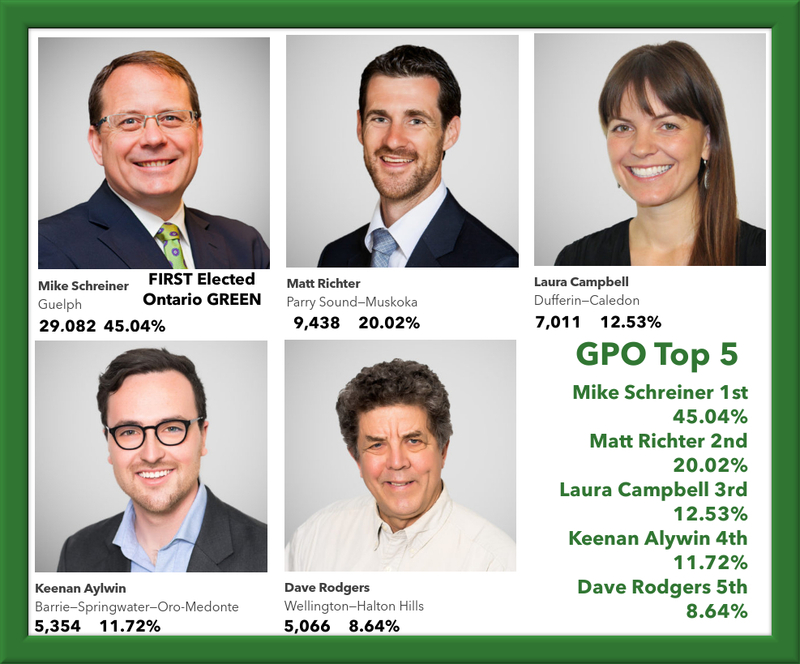 Green Party of Ontario Leader, and Guelph MPP candidate Mike Schreiner‘s 45.04% riding vote percentage was the highest in Ontario. This resulted in the first seat in the Legislative Assembly of Ontario won by an Ontario Green Party Candidate. Parry Sound—Muskoka‘s candidate Matt Richter ranks 2nd with 20.02%. Laura Campbell ‘s 12.53% of the vote won in Dufferin—Caledon placed her in 3rd position; Barrie—Springwater—Oro—Medonte candidate Keenan Aylwin’s 11.72% of the vote ranks him 4th, and Dave Rodgers 8.64% in Wellington—Halton Hills makes him the 5th highest ranking Ontario Green candidate by percentage. The Green Party of Ontario is making history, and these five candidates are leading the way forward. Onward! Congratulations WRGreens ~ We Made History! 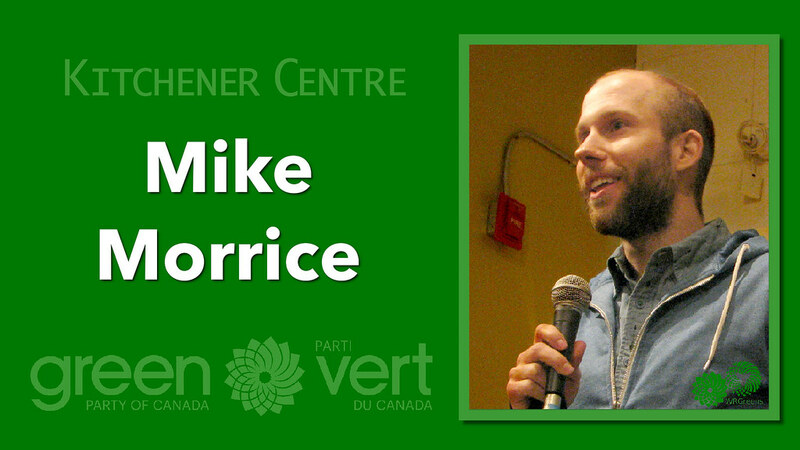 We’re all very excited that Mike Schreiner won last night. Finally a Green has broken through in Ontario. 2015 Waterloo candidate Richard Walsh joined the party. What I have to say here is how proud I am of the hard work and dedication put in by all the WRGreens Candidates and volunteers. Our work certainly paid off in the votes our candidates earned. First time candidate Zdravko Gunjevic earned a whopping 4.83% of the vote in Waterloo. Bob Jonkman won 6.51% of the vote in Kitchener—Conestoga. 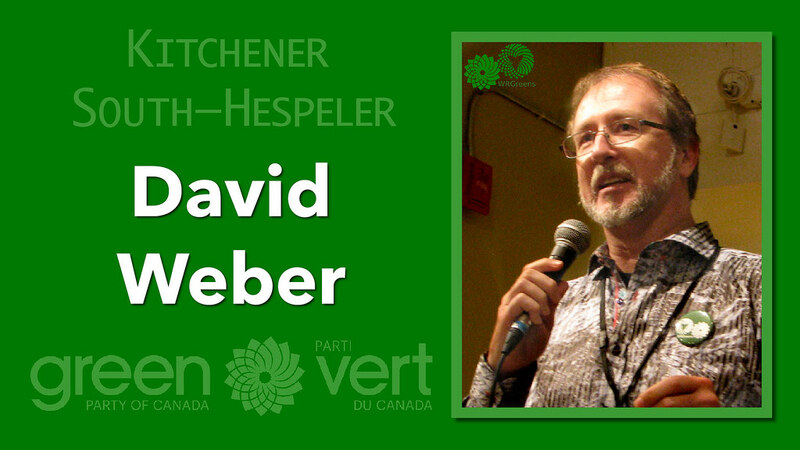 David Weber won 7.35% of the vote in Kitchener South—Hespeler. Cambridge Candidate Michele Braniff (at the TIE debate) and Kitchener Centre Candidate Stacey Danckert (at the African-Canadian Debate) were in Guelph to support Mike Schreiner representing the WRGreens. Michele Braniff won 6.27% of the vote in Cambridge. Stacey Danckert won 6.84% of the vote in her new riding, Kitchener Centre. At its peak, I couldn’t get all the Green Partiers in a single photograph! But this is just the beginning of our story. Onward! In-person voting at returning offices ends on June 6 at 6 P.M.
One of the first events I attended as the Green Party of Ontario candidate for Kitchener–Conestoga was the InterCityRail Town Hall meeting on High Speed Rail, held Wednesday, 18 April 2018. Kitchener–Conestoga rural residents are worried about the High Speed right-of-way cutting their farms in two, and since HSR cannot have at-grade crossings (because HSR is 200+ km/h speeds), farmers are concerned that they’ll have to detour tens of kilometres out of their way to access their farmlands — InterCityRail says only four grade-separated crossings are planned between Kitchener and London. 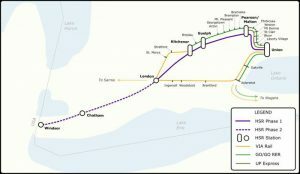 There would be only seven stops: Starting in Windsor, through Chatham, London, Kitchener, Guelph, Malton, and ending at Union Station in Toronto. None of the smaller communities such as St. Mary’s or Stratford would have service. Not even the large community of Brampton is slated for a High Speed Rail station. If the experience of expanding GO Train service around 2012 is anything to go by, VIA Rail will cut its service to those communities once High Speed Rail is established. An alternative, High Performance Rail (HPR) has been proposed that would allow slightly slower trains (150-180 km/h) to run on the existing right-of-way and still have grade-level crossings, but the Minister of Transporation, Kathryn McGarry (Lib), has flat-out said the government will not consider anything in their EPA study except a new High Speed Rail corridor. And the Ontario Federation of Agriculture that represents the farmers directly affected by this have not been consulted, and do not have a voice in the decision making. I was a fan of High Speed Rail until attending the Town Hall meeting, which was educational in informing me about High Performance Rail and the issues farmers face with HSR. 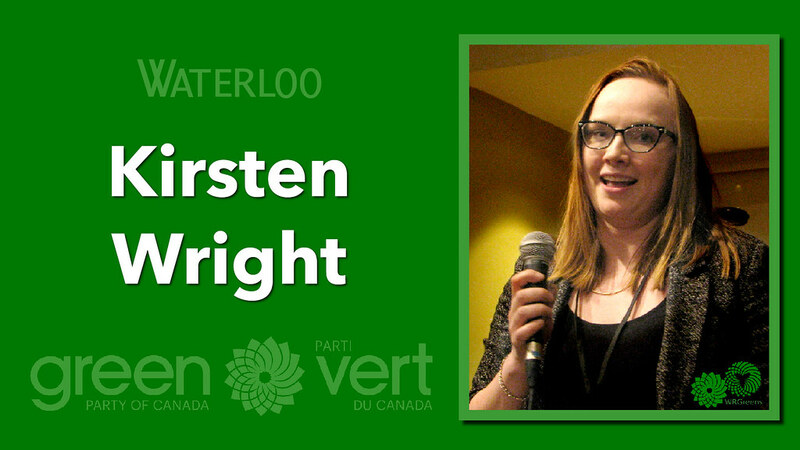 The Green Party’s Vision Planet document says: “Prioritize low-cost high-performance rail in the short-term as the province plans long-term for higher-cost, high-speed rail projects.” But as the representative for Kitchener–Conestoga I will advocate that High Performance Rail should be the ultimate goal, the better to keep farms together, preserve farmland, protect wildlife, and provide better rail service to smaller communities. Actually, it’s more than Kitchener–Conestoga residents who are concerned, also Oxford and Perth–Wellington residents are affected, and more. Hopefully we’ll have Green Party Members in those ridings soon! The Liberals in previous years had a bad habit of having expensive dinners that cabinet ministers could attend. This is a problem as it means rich people have more access to the government then people with little or no disposable income. This can be a problem in a democracy. In democracy, money shouldn’t outweigh citizens. Mike Schreiner led the charge to reform political fundraising laws in order to stop this ‘pay for access’. During the process he also got corporation and union donations to political entities banned, brought down the donation limits (although the new limits are still higher than most people can afford). Candidates, MPPs, cabinet ministers can no longer attend fundraising dinners. People do not have to pay to access Ontario politicians. You can donate $1222 in total to election campaigns. This can be donated to one campaign or spread out over several campaigns. The maximum you can donate in total is $3,666 in total. Election Finance laws are mildly frustrating for someone in the position of CFO or as a fundraising director. Having to say, “Sorry, you can’t donate that much, as much as I would like to accept it” or “no we can’t charge admission to this event” is hard to do. That is why the recent Earth Day rally in Guelph with David Suzuki, Sarah Harmer, Elizabeth May and Mike Schreiner was free. Anyone could attend the event. We did ask for donations at the event, which is allowed, but a donation was not required for attendance. However, the frustration is worth it to make democracy stronger. Everyone should have access to the people running for office and in office without having to pay for the privilege. The representatives elected to the Legislative Assembly of Ontario are there to represent us, the people in the province. Right now, we are having an election, essentially one big job interview for candidates. We all should have access to them, no matter how much money we have, because the candidates who are elected are supposed to represent us at Queen’s Park. When people running for office break Election Finance laws, I wonder what they do they really think about democracy? What other laws will they break to get or retain power? The laws governing election spending limits and ‘pay for access’ are there to help make our elections fair and democratic. Large election events don’t just happen. They are never planned in isolation. Candidates (and especially leaders of parties) never just show up. Ignorance of the law is no excuse and is never an excuse. Election laws are there to protect you, the people of Ontario. The event was a series of round tables connecting people with candidates, interspersed with 3-5 minute talks by candidates and representatives from the local culture scene. The speaking order was determined by drawing names out of a bowl, and as it happened, our Green Candidates dominated the beginning of the evening. WRGreens were honoured to be included in this valuable event. 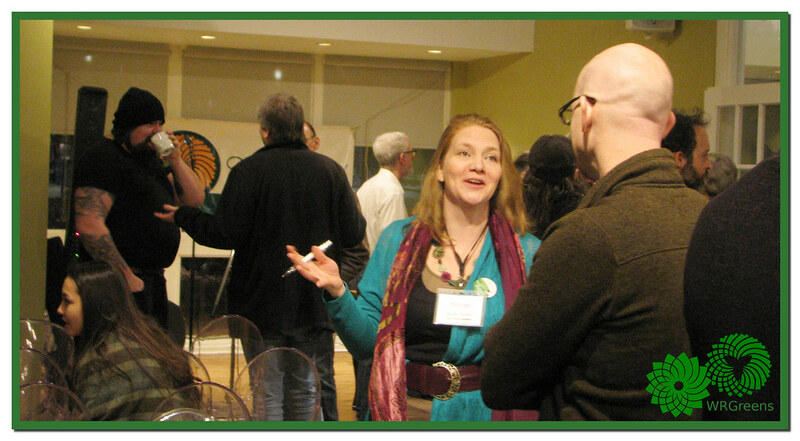 Join the Waterloo Region Greens tonight at The Museum. Here’s a clip of Kitchener—Conestoga candidate Bob Jonkman speaking at the 2015 Museum event.